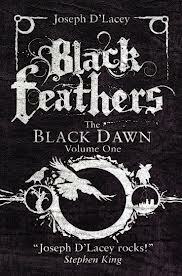 ‘Black Feathers’ is a postapocalyptic eco-dystopian fantasy, told in two threads, with not one, but two different Chosen Ones, spread across an unknown amount of time. There’s Gordon Black, born in a thunderstorm and with an affinity for crows, ravens, rooks, magpies â€“ all the corvids, in fact, and then there’s Megan Maurice, sometime in the far future, after environmental and social upheaval has reduced the global population by 90%, and humanity is living in harmony with the land. Both characters are on the cusp of adulthood, which appears to be critical to the voyages of discovery each will go on. Gordon must find the Crowman, a mythical figure that appears to be a trickster, both good and bad, who will usher in the world’s destruction, salvation, or both. Megan is apprenticed to a Keeper, a shamanic figure who keeps the knowledge of the world safe for the good of all, part scientist, part storyteller, part doctor. Megan appears to be a prophesied one, the first woman Keeper, and the one who will remember all the forgotten secrets of the Crowman. She goes on a series of lessons and vision quests, seeing Gordon’s journey throughout. Gordon, meanwhile, is born under all sorts of terror: In a storm, the windows blow open, crows have an affinity for him, and odd things happen to and around him â€“ not the least of which is a progression of black feathers. Behind all of this is the Ward: a group of people who arise out of nowhere and appear to be political party, movement, and mob all in one. They appear in grey raincoats, and occasionally do and say things that make them allied with totalitarian governments and the New World Order: “All that”. They’re also destined to stopping the Crowman. ‘Black Feathers’ is a compelling read â€“ it’s an Angry Robot title, and they’ve a well-deserved reputation for putting out fiction that is entertaining, enjoyable, and interesting, for bringing new and emerging voices into print, and one suspects either their editorial process or their selection process (or both!) tends towards these types of books. It’s enjoyable, and the worldbuilding is first-rate. Despite occasional slow bits â€“ it’s tough to keep the action moving when large chunks of it are dedicated to lessons, many of which are worldbuildng in disguise â€“ the slim tome is readable and fascinating. I can’t help thinking that it can’t quite decide whether it’s an action adventure or a concept piece. It has a bit of both, and appears to suffer a little personality disorder â€“ but maybe it’s just that I want it to fulfil its potential. There’s another volume coming, and I’m definitely planning on reading it.